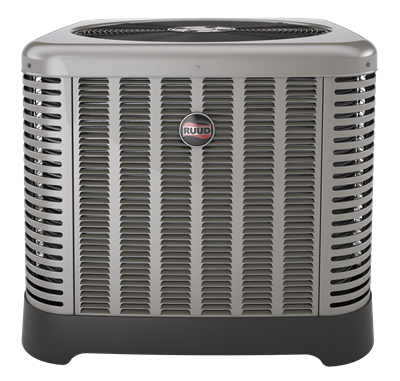 Part of a split system heat pump or air conditioner's outdoor unit that controls the pressure applied to the refrigerant, necessary for taking in heat to warm your home or getting rid of heat to keep your home cool. Part of a split-system air conditioner or heat pump. By converting refrigerant that is in a gas form back to a liquid, the coil sends heat carried by the refrigerant to the outside. A type of "valve" used in ductwork that opens or closes to control airflow. Used in zoning to control the amount of warm or cold air entering certain areas of your home. A type of furnace that takes cool air from the top and blows warm air to the bottom --common when your furnace must be located in a second-floor closet or utility area. Part of a split system air conditioner or heat pump located indoors. The evaporator coil cools and dehumidifies the air by converting liquid refrigerant into a gas, which absorbs the heat from the air. The warmest refrigerant is then carried through a tube to the outdoor unit (condenser coil). A type of compressor used in air conditioners that compress refrigerant by using a type of "piston" action. A specially designed compressor that works in a circular motion versus. an up and down piston action.